I am not a dieter. I’m just not good at depriving myself of food or following strict rules about food. I find myself getting obsessive about every little calorie and gram of fat and protein and carb and it makes me crazy and angry, so I just don’t do it. I don’t weigh myself, either. To me, my weight is just a number. After many years of being a personal trainer and weighing hundreds of people and measuring their body-fat, I deducted that all this process does is provide a number. People have a tendency to get a certain number in their head of how much they should weigh. This number may be based on how much that person weighed at their thinnest (even if they were in high school at that time), or how much their friend weighs, or perhaps on a generic height-weight chart in their doctor’s office. Even if this person eats healthfully, exercises regularly, has perfect health, looks great and fits comfortably in their clothes, they can still get worked up about not being that specific number. Trust me- I’ve been in that place too. I’ve barely fed myself and gone on 10 mile runs, just to get on the scale the next day and find that I was still the same weight. Even though my extra-small workout pants were baggy on me, I hadn’t yet reached that number and it freaked me out. Today, I don’t wear extra-small workout pants, but I’m healthy, I’m fit, I’m not overweight, and I look pretty great (though I may not feel that way everyday). My body is shaped exactly the way it was meant to be shaped today. It’s far different than it was ten years ago and it’s far different from where it will be ten years from now. It might have been slightly different yesterday and it might be slightly different tomorrow as well, but today, my body is perfect for today. It’s been through so much and stayed strong throughout and I am eternally thankful for this body that I’ve been given. I have not always had this relationship with my body. I used to spend quite a bit of time being very critical of it (and truth be told, I still fall into that trap on occasion) and letting my body image affect how I enjoyed my day. Switching to an entirely plant-based diet really helped change my point of view. I watched as my body flourished from only eating plants- more energy, no more bloating, clearer skin, sleeping better at night, stronger hair and nails, rarely getting sick- the list goes on and on. By removing dead animals and animal byproducts from my body and replacing them with living plants, I felt more alive, more vibrant. I could see my body for the incredible gift that it is and when I think about that, the size of my jeans seems rather insignificant. It is because I’m so thankful for my body that I choose to not diet, but instead just live a healthy, balanced lifestyle 100% of the time. I do some form of exercise almost everyday. I limit my sugar intake (partially because I have PCOS and I’m hypoglycemic and my body doesn’t metabolize it very well), but I don’t deprive myself of a (healthy-ish) vegan dessert when I want it. I’m working on only eating when I’m hungry and stopping when I’m full (though this is still a work in progress). I don’t let myself sweat the small things (for the most part) and I make sure to laugh as much as I can each day. I judge my health by blood test results (absolutely perfect, thank you for asking. No vitamin deficiencies here! ), how I feel, and how my clothes fit. Just like everyone else, there are times that I overeat or I miss a couple workouts and sure, I feel my jeans get a little tighter in the derriere region. During those times, I might trade pizza for salad for a few days, or step it up at the gym that week, or just remind myself that it’s that time of the month. No diets, no weighing myself, no obsessing. It’s not worth it to me. I realize that this is a weird post to write in the middle of January, when weight-loss resolutions are running rampant. This is the time to be suggesting ways to cut calories and burn fat and trying to help you lose that holiday weight. Even though that was my job for 8 years, I feel that abandoning the diet and the scale and adopting a permanent, healthy, plant-based lifestyle may be more beneficial to all of us in the long run. It’s not my place to prescribe this or any other sort of diet plan to you, but I do believe a long-term change is better than a short-term fix. I was recently very inspired by this post by Ginny and JL at Our Hen House, and if you’re interested in learning more about ditching diets and the scale and adopting a long-term plant-based lifestyle can help your health and your body image, you should definitely read it as well. 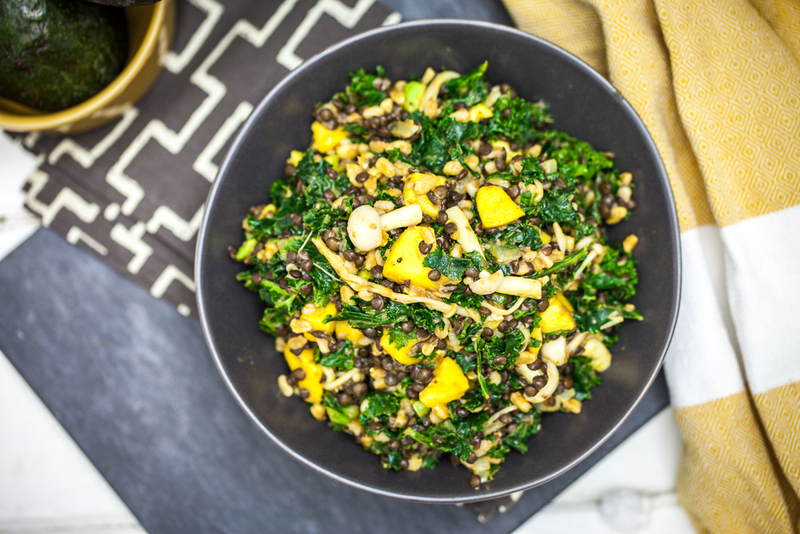 Today’s recipe is a great example of a typical, absolutely crazy-delicious, super-balanced plant-based meal. It provides protein, carbohydrates, healthy fat, as well as tons of your daily vitamins and minerals. 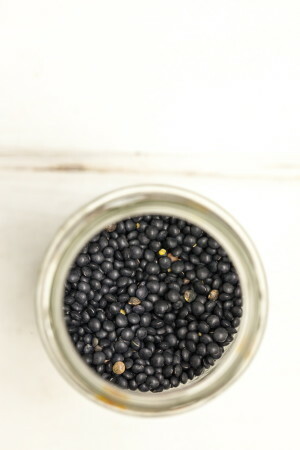 The beluga lentils (black lentils), aside from looking very shiny and fancy and reminiscent of caviar, pack a whopping 12 grams of protein and 9 grams of fiber per serving, in addition to being full of anthocyanins, the memory-boosting, cancer-fighting antioxidant found in blue-purple fruit, such as blueberries or plums. Farro, my favorite grain these days because of it’s nutty flavor and chewy texture, is packed with protein and fiber, is a great source for many vitamins and minerals, as well as antioxidants, and contains a type of carbohydrate (cyanogenic glucoside) that helps boost your immune system and balance your blood sugar levels (Score!). 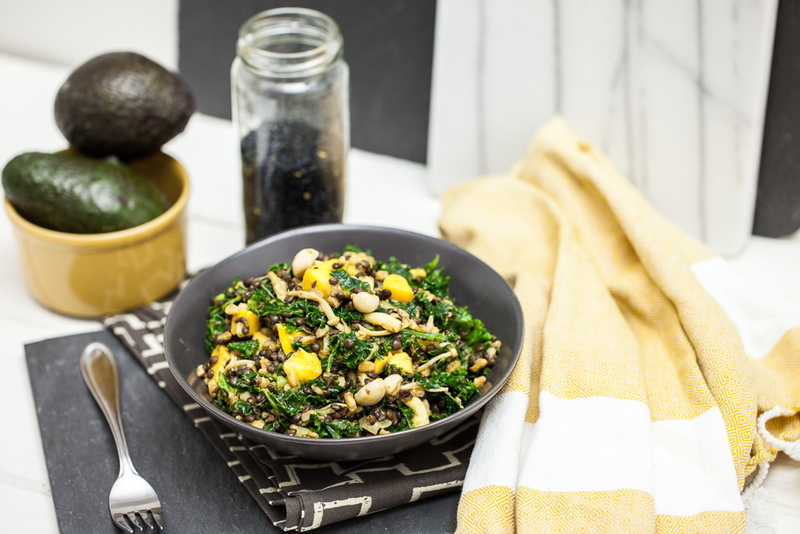 The kale is massaged with a citrus mustard dressing and allowed to marinate for a few hours, making this less of a leafy salad while retaining all of kale’s many health benefits. The avocado, in addition to lending a creamy texture, provides your body with healthy fats as well as tons of vitamin E, folate, and several cancer-preventing properties. 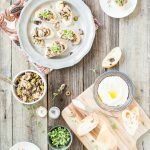 Mushrooms are the only type of vegetable to absorb vitamin D from sunlight in the same way that humans do, so mushrooms are a great natural plant source for this vitamin, as well as for B-vitamins and iron. 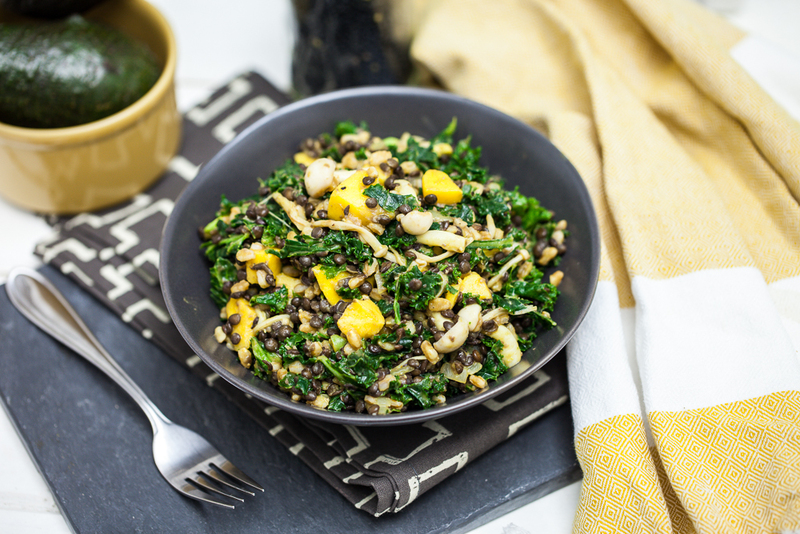 Lucky for us, this salad has two types of mushrooms! Finally, the bright, juicy, flavor-packed mango provides tons of vitamins C and A, helps in stabilizing blood sugar and insulin levels, and contains enzymes that aid in the digestion. How about that for a getting a huge bounty of beautiful, delicious, balanced nutrition in one bowl?! I don’t know about you, but I’d take this over a restrictive diet plan any day! Begin by making the dressing and marinating the kale. To make the dressing, combine all of the ingredients in a cup and whisk together until well mixed. Place your finely chopped kale into a large bowl. Pour 3 tablespoons of the dressing onto the kale. Massage the dressing into the kale for about five minutes. Cover the bowl and refrigerate for 3-4 hours. Cover the remainder of the dressing and refrigerate it as well. Once you are ready to prepare the salad, cook your mushrooms and onion. Heat the olive oil in a large, shallow sauce pan over medium heat for about 30 seconds. Add the onion and sauté until translucent. Add the mushrooms and sauté for about 4-5 minutes until softened and lightly browned, but not falling apart. Dump the contents of the pan into the bowl of kale and set aside. While the lentils are cooking, pour the vegetable broth and farro into a medium pot, cover and bring to a boil. Once it begins to boil, reduce to a simmer, cover again and allow to cook for about 10-15 minutes, until soft and most of the broth has cooked away. Keep an eye on it to prevent burning/sticking. Once it has cooked, drain the remaining liquid and set aside. Allow to cool for about 5-10 minutes. 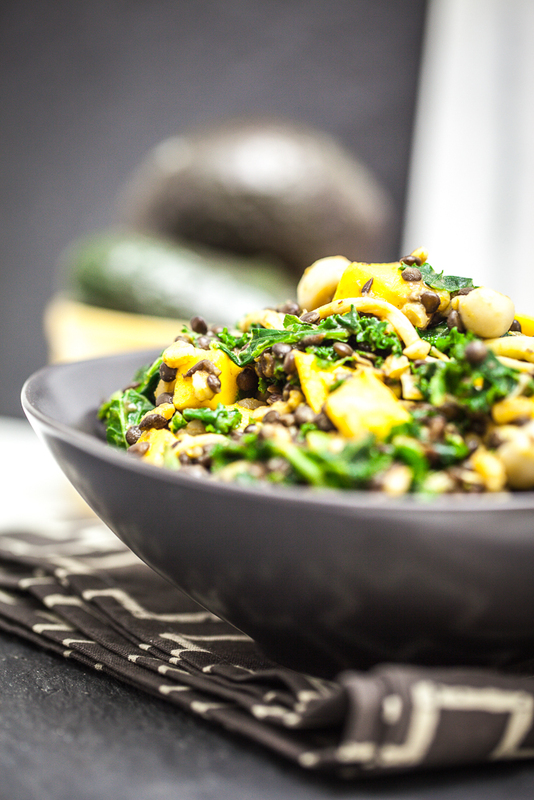 To make the salad, add the avocado, mango, lentils, and farro to the mushrooms and kale. Pour in the rest of the dressing and toss until fully combined. Be very gentle with it, as the lentils will mash easily. Serve at room temperature or chill until ready to serve. This salad will keep, refrigerated, for 1-2 days. Enjoy! Do you diet or do you live a healthy lifestyle? Do you weigh yourself? What healthy habits help your self-image? 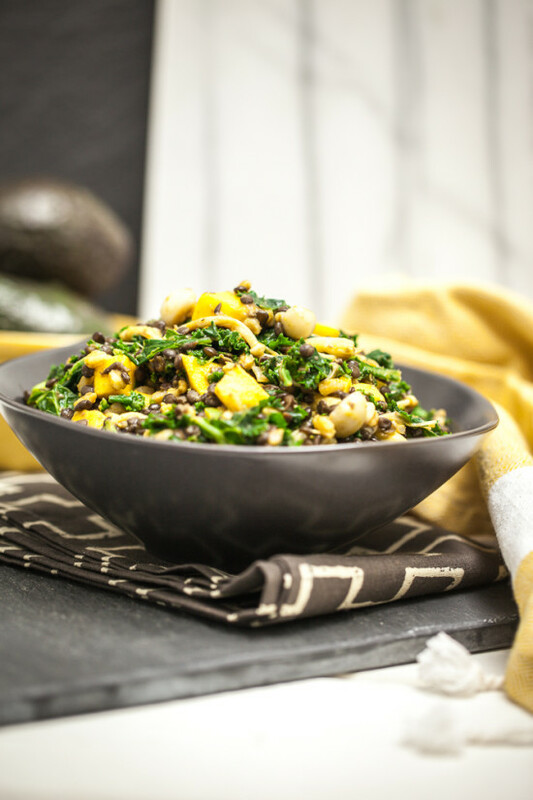 37 Responses to "Beluga Lentil & Farro Kale Salad"
Thanks for sharing your great attitude towards weight and healthy living. The more people who can get this this all-important message out the better 🙂 Scrummy looking salad too! This looks AMAZING!! I will be making this with the next batch of farro I buy! 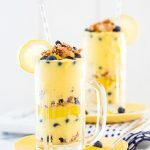 Great post AND recipe Kristy! I’ve had an on again off again relationship with the scale myself – having had two children and gained almost half my body weight each time (pretty crazy for little me I know!!) – I’ve lost significant amounts of weight each time and gained lots of good insight into the progress that can be gained by weighing ourselves for motivation. In certain circumstances it can be a great tool, but not so much for those who are in good health & fitness already. I still weigh myself from time to time to keep myself honest, and I could not agree with you more about not obsessing over such things! 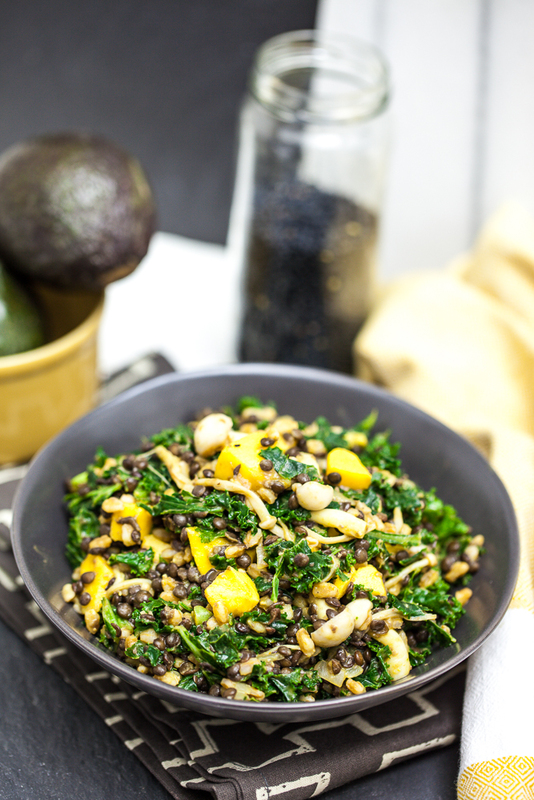 Lovely recipe- must go find me some beluga lentils! Body image is such a tricky issue. Some days I feel great, and others I feel the complete opposite. Of course negative thoughts cross my mind sometimes, but I don’t weigh myself, and I certainly don’t diet. I just try to do what makes my body feel its best, and whatever that is has changed over time. I’ve definitely seen the other side though. I’m a climber, and weight to strength ration is an important aspect of the sport, so I know a lot of people who are super conscious of their weight and definitely take it in an unhealthy direction. What an incredible recipe–and a lovely sentiment, my dear. I couldn’t agree more on all fronts. And it sounds like I may need to ask you for a green recovery story sometime! I’m learning more and more how much better my body and mind feel when I focus on a HEALTHY diet as opposed to a low-calorie/low-fat or other deprivation diet. Finding much inspiration in your blog. Thanks for sharing! Thank you so much for your sweet note, AY. It really means a lot to me. I completely understand. I always feel like I’m in some sort of jail when I’m dieting and tracking my weight. I easily get obsessed with numbers- calories, grams of fat, my weight, and before long, I feel trapped and hopeless. It’s just not worth it anymore. My body is going to weigh whatever it’s going to weigh, but as long as I take care of it, it will take care of me. And that’s enough for me to be happy. Originally, I had decided 2013 would be the year I finally lost 15 pounds. But when Jan 1st hit, I realized I was not so concerned about my weight. I realized I was more concerned at my lack of energy and zest for life. I decided I needed to take better care of myself and have made it my goal to slow down in 2013. I plan on eating good food, having better sleep patterns and go for lots of walks. I want a balanced, healthy lifestyle. And I want energy to do all of the things I enjoy in life. It’s slow going, but I’m making some good changes to help me get on track 🙂 This salad could definitely help me eat better! 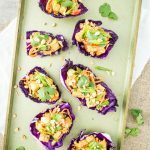 Great post & recipe Kristy! I can relate to most everything you touched on regarding weight , the scale and the NUMBER on that scale and what it should read exactly – the older I get the easier it is to look past that number and know that I am happy, healthy & strong – I measure my fitness on strength and endurance rather than the scale, Like you I can still fall into the numbers game and we all have our not so good days either. 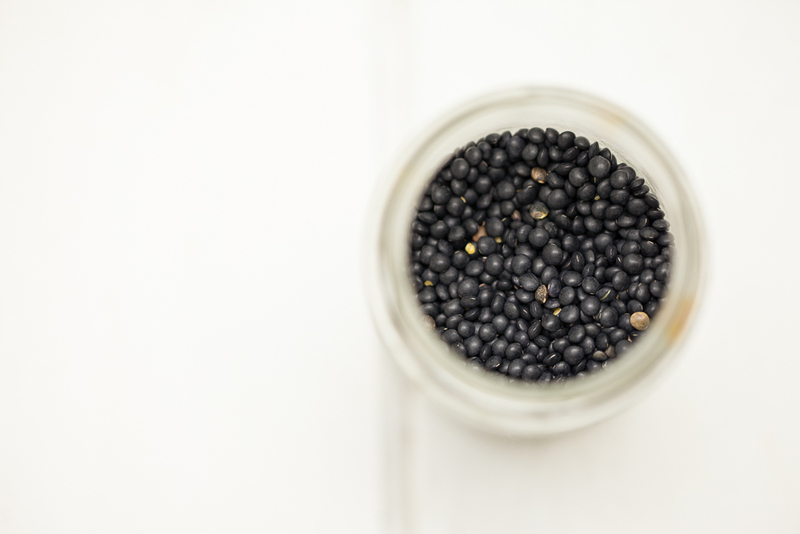 I LOVE beluga lentils but had no idea how many health benefits they had – I mean I know they are good for you but after reading this I learned they are incredibly healthy!! Thanks for always sharing great recipes and being open and honest- xo. I am absolutely thrilled to have found your blog – this post in particular. 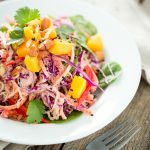 Not only because I was looking for a great vegan salad recipe to bring to a friend’s for dinner tomorrow – but because your attitude about body image and true health is SO refreshing! Thank you for reminding me about the benefits of a plant-based lifestyle – especially the peace it brings, physically AND mentally. I so enjoyed this post! It’s always fascinating to read another person’s weight story, because so much of our own self-image is caught up in it. It sounds like you’ve come to a really healthy place with it. 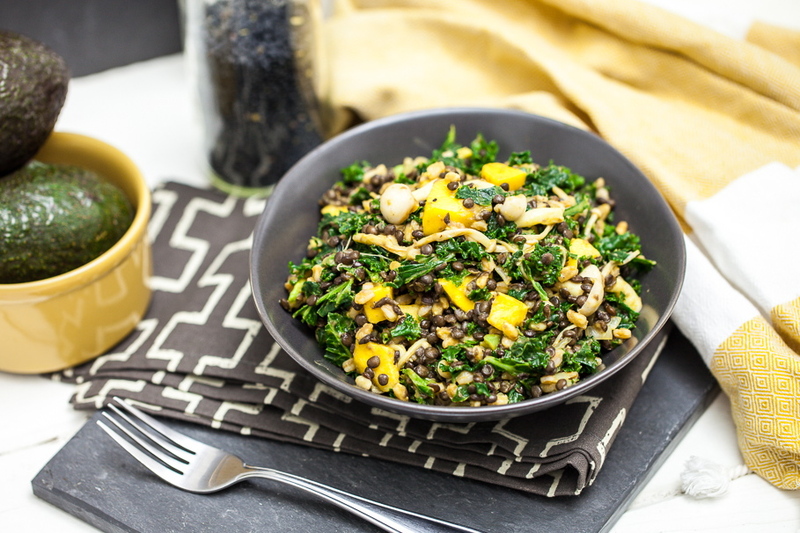 This salad sounds amazing and brings together two of my favorite foods – kale & lentils. Although, I’ve never tried beluga lentils before! I’m looking forward to trying them out! Thank you, Cadry. It’s so true, isn’t it, how much weight can affect self-image. I feel that I’ve come quite a ways in not letting weight affect I feel about myself (though there are days I’m sure I could improve) and I hope that I can encourage others who are struggling with this issue. Sorry for the late comment; I discovered your blog only yesterday (love it so far!) and have been catching up on older posts. Your words in this particular post really resonated with me. “My body is shaped exactly the way it was meant to be shaped today. It’s far different than it was ten years ago and it’s far different from where it will be ten years from now.” Wow! In a way this is such an obvious idea, yet it is so hard for many women to understand or accept. Your positivity is inspiring. I look forward to reading many more posts! Thank you so much! Your comment means so much to me- I am just so flattered that this post was inspiring to you. 🙂 Welcome to Keepin’ It Kind- I’m glad you found us! This recipe looks great! 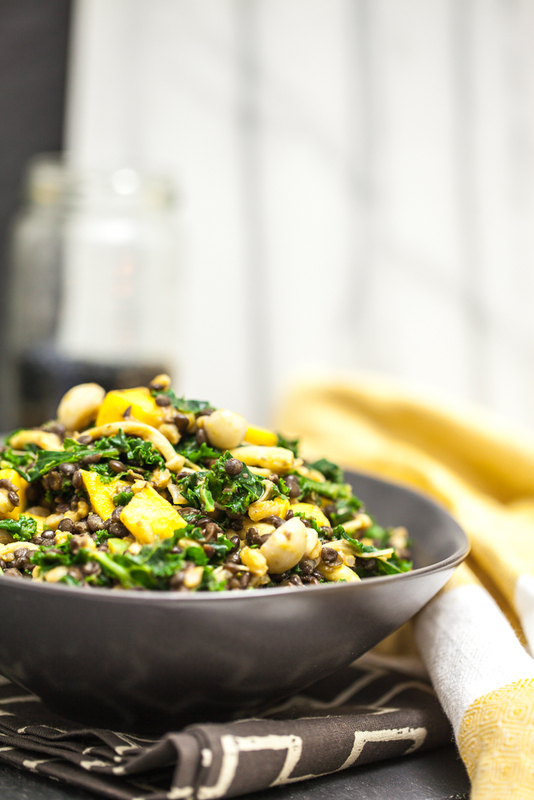 I love beluga lentils–they’re probably my favorite plant-based protein. Just a note, though, I found this recipe on the gluten-free page on your site, and farro is not gluten free. It’s a type of wheat, so it contains gluten. Just a warning since I wouldn’t want anyone to get sick from it in case they didn’t know. I’ve just found your site and so many recipes look so amazing. I’ve pinned so many already. I can’t wait to start cooking! I love your stand here. My favorite line is “….weight is just a number”. It really is! But most people are so intimidated by the numbers they see. I’m dying to try this recipe.